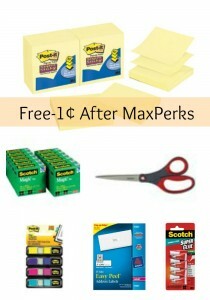 This week’s OfficeMax MaxPerks Bonus Rewards are pretty awesome! There are over $300 in products that are free or a penny after rewards online. Shipping is FREE with a $50 order and thru 8/17, choose Free Twizzlers or a FREE Tote set with any $150 purchase using the coupon code TWIST or TOTE. See all the other office supply deals you can snag this week!